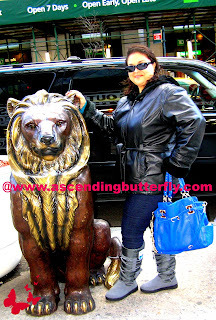 Ascending Butterfly: My Winter Standout Boot! Living in the Northeast comes with one thing you can count on, super COLD winters! Snow, cold and ice are constants, and when rain factors into that mix, you get pure sleet, which is not only deadly on roadways but equally dangerous while walking the icy City streets. Boots have always been my obsession, second only to handbags, and for the most part, much like handbags, there are boots for different purposes and occasions in my closet. I of course can't get enough of the Equestrian trend and style, but New York winters really do a require an all-weather boot that is really going to not only withstand the winter, but keep me steady on my feet in the snow and ice. And because I'm well, ME, it needs to be cute too, it needs to be a pair I really want to reach for, not just have to reach for. I've been living in my Boreal by BEARPAW Boots this winter, and for good reason, they are not just functional, but also super fashionable. 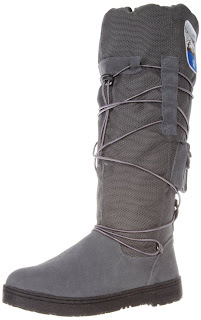 I have other boots by BEARPAW but these are a bit different in a few ways. these are a more *snug* fit, but please know I do NOT mean that in a bad way. You will feel these a bit snugger on the instep, width and toebox than other boots in the line. They tell you on their site to size up one full size, this is definitely correct, this is not just other users telling you so you may think it's subjective, it's the ordering page for the boot that tells you this. Please don't ignore it, you will need to size up a full size because these don't run in half sizes. They are long but the opening is meant to fit you snugly so snow doesn't get in. While they are not touted as Wide Calf in any way, I can tell you that I am a Wide Calf and usually require boots that specifically say they will accommodate a Wide Calf, and these fit me wonderfully around the calf. They are snug enough so snow doesn't get in, but fully and comfortably accommodate my calves! I love that these work well with my Wide Calves, they are tall so when the snow drifts at the end of each sidewalk become a snow mountain, I can easily maneuver with these. While the snugger fit did take a small break in period (I have a super high instep), they did break in quickly. I also have a toe with a past fracture and was pleasantly surprised that these did not bother my toe in any way. I'm wearing them in 'Charcoal', and I saw other user reviews complaining that they thought Charcoal would be black, but it's not, it pictures like a Grey (which is actually why I picked them) and they are a true grey, not silver and definitely not black in color. These are not like the oh so popular 'slipper boots' in feel, these offer a very supportive frame and a real sole, they are not super flat on the bottom which I love. I find they do offer ankle support because of the way they are constructed and that helps keep me stable on the snow and ice which I love. These definitely get high praise, warm, full on weather boots with great fashionable touches and details, what's NOT to love? While I wasn't able to offer a giveaway this time dear butterflies, please know that BEARPAW hosts their own contests via their social channels, so you definitely want to be sure you are already following them! What Boots Have You Been Living In This Winter Butterfly? FTC Disclosure: Ascending Butterfly received a pair of Boreal Boots by BEARPAW for Editorial Consideration, however as always all opinions are 100% my own. Snazzy looking boots.I love bear paw,but these really caught my eye.On my way to nab a pair. @Big Happy Buddha - I know you will love them! The boots look great & so comfy! @Audrey Allure - They are definitely a must have all weather boot for your wardrobe!